LinkedIn has never been the shiniest object among its social media peers. However, it’s arguably one of the most useful websites for career and business development activities such as recruiting talent, applying for jobs, generating leads, getting clients, and networking. LinkedIn offers a basic/free account, which millions of people use to maintain their online professional profiles. I’ve been on LinkedIn since October 18, 2009. I joined the platform because of the initial hype that surrounded it and to expand my online footprint. I’ve made countless changes and tweaks to my profile since. I’ve never focused on LinkedIn as a way to make money online as I have with Facebook and YouTube because LinkedIn is one dimensional by comparison. Nevertheless, I took another look at LinkedIn to assess how I could use it to grow my performance marketing agency. I decided to try LinkedIn Premium to get leads and clients. With InMail you can send messages to people outside of your network and connections. Messages can have up to 200 characters in the subject line and up to 1900 characters in the body. You must enter something in the subject line before you’re able to send the InMail. LinkedIn offers both monthly and annual billing. Depending on what option you choose, your membership will be renewed at the end of each month or year. If you decide to pay annually, you’ll save up to 20 percent compared to paying monthly. Here are the monthly fees based on annual billing. I tried LinkedIn Premium for 30 days and chose the business plan. Seeing the gold premium icon beside my name was cool. I was able to see who’s viewed me in the last 90 days and how they found me, for example, on the homepage or through a connection. I sent a few InMail messages but didn’t get replies. However, I did receive messages from people who were outside of my network because I was on a premium plan (InMail works both ways, that is, you can send and receive messages from individuals who aren’t connected to you). I didn’t take any courses on LinkedIn Learning as I prefer to take classes and specializations on Coursera. Send a person a connection request and add a note about why you want to connect with him or her. That’s how I’ve developed relationships and grown my LinkedIn network. Review the person’s profile to see what groups he has joined, and request to join those groups. 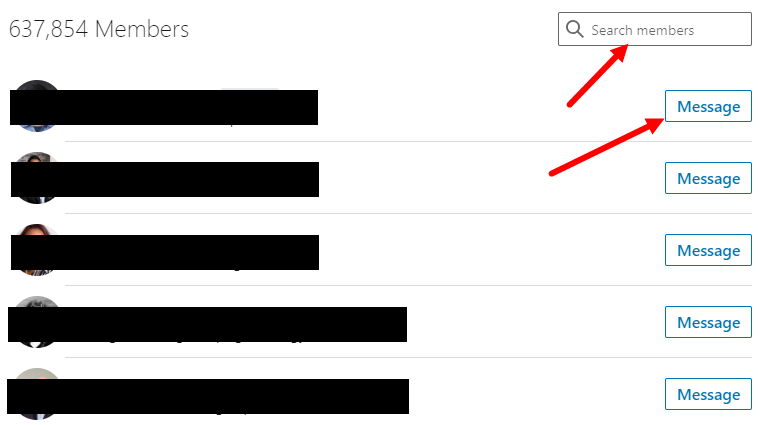 When you become a group member, click on “members” or “see all” (in the top right corner) and search for the person. More than likely, you’ll be able to message that person. See the image below. Ask for an introduction. Contact your mutual connections, one at a time, for an introduction to the person you want to reach. Contact the person through a different channel such as Facebook, Messenger, YouTube, and Twitter. LinkedIn isn’t the only platform for developing relationships and communicating. Visit the person’s company and personal website. Those sites will likely have a contact form or email address. Subscribe to the target’s email list. One surefire way to get in touch with me is to subscribe to my email list and respond to one of my emails. Use an email lookup service. Many email search companies offer free and paid plans including Clearbit Connect, Hunter, Find That Email, and more. Ahrefs, an SEO software company, tested several email lookup services to understand how they perform. I wasn’t impressed with LinkedIn Premium because it didn’t seem that different from my free account. Furthermore, there’s no way I could justify spending a minimum of $360 annually for it. The additional features, insights, and analytics that accompany premium are mediocre. Perhaps its only notable feature is the premium icon that gives you the appearance of being in the “in” crowd (no pun intended). You could make the “get one client, and it pays for itself” argument, but that’s a dumb premise because you can also get clients without LinkedIn Premium (as I have). There are many alternatives to LinkedIn Premium that are more practical and cost-efficient. Also, there are many other products and services that will benefit your business more. Since I tried the “business” plan, I don’t know how other plans for different users measure up, for example, a recruiter might find the “hiring” plan useful.